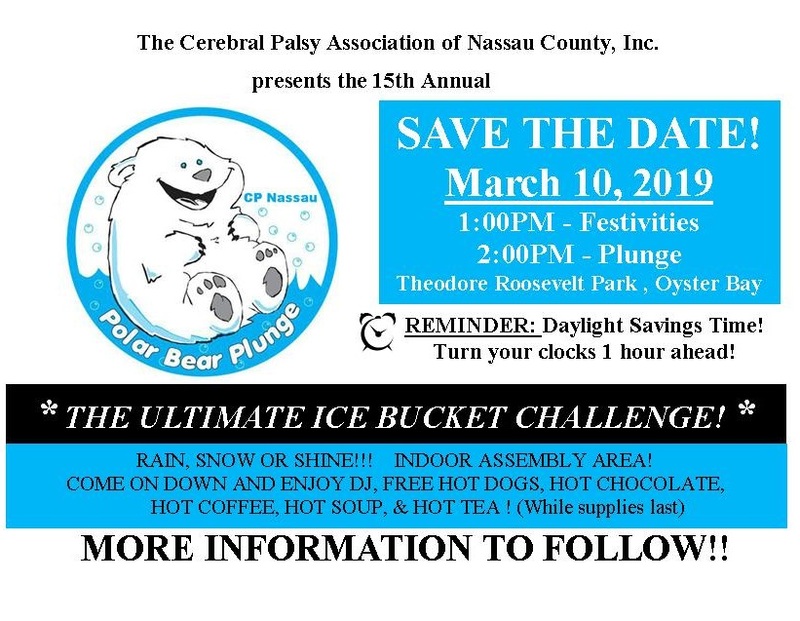 – In support of the Cerebral Palsy Association of Nassau County (CP Nassau), Oyster Bay Town Supervisor Joseph Saladino invites residents to a Polar Plunge taking place on Sunday, March 10, 2019. The highly anticipated benefit features hearty and caring participants, affectionately known as “Polar Bears,” taking the plunge in the chilly waters off of the Town of Oyster Bay’s Theodore Roosevelt Memorial Park, Beach and Marina in Oyster Bay. The festivities will kick off at 1pm with the polar bears taking the plunge at 2pm. Residents attending the plunge will enjoy music, hot chocolate, coffee, tea, hot dogs, soup from local Oyster Bay establishments, raffles and other surprises at no charge. An indoor assembly area will also be available for the event, which will be held rain, snow or shine. The day’s proceedings will benefit the more than 1,500 children and adults with disabilities who participate in programs and receive services through the Cerebral Palsy Association of Nassau County, which has been assisting individuals with disabilities since 1948. Participants can organize their fundraising efforts by visiting 15th-annual-polar-bear-plunge.everydayhero.do. For information about participation as a swimmer or a sponsor, please contact the Cerebral Palsy Association of Nassau County event organizer Mary Brosky at (516) 377-2064 or visit www.cpnassau.org.